A seven hour drive across the windswept nothingness of West Texas got me thinking. Not so much about Texas, but about a far away place that always leaves me a bit awestruck: France. Long ago, on our very first trip overseas, we spent two weeks in France; moving from Paris, to Burgundy to the Loire Valley. I left that trip convinced I could spend another two years traveling the country without ever needing to visit the same place twice. There’s Normandy in the North, the Rivera in the South, Bordeaux in the West and Strasbourg in the East. 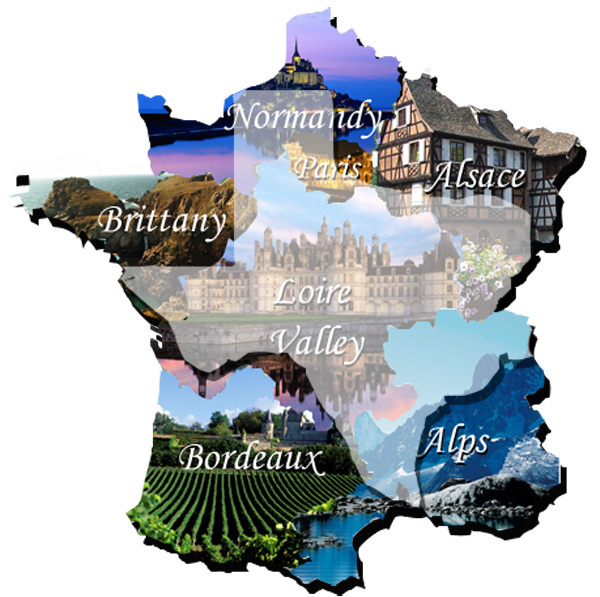 Normally that would be enough for any area to claim tourism bragging rights, but in the middle of all that greatness France layers in castles, quaint towns, beautiful cities, historic vineyards, and majestic mountains. The diversity of the country is overwhelming. Then there is Texas. Geographically it’s nearly identical in size to France, with both covering about 680,000 square kilometers. Could I spend two years exploring all of those Texan miles? Probably, but it wouldn’t all be enjoyable. Certain stops, like San Antonio, Austin and Big Bend, would please, but they’re tiny compared to all that real estate. We’d have to plan hard to chart a seven hour drive through France as desolate as the one we endured getting through West Texas. It may not even be possible. The similarities in size got me thinking about something else, too. How often had I heard the expression “everything is big in Texas”? By most objective measures, however, France is bigger. Its population is nearly three times as large. Mont Blanc’s 4,810 meter peak towers over diminutive Guadalupe’s mere 2,667 meters. Its 4,853 km of coastline is more than eight times longer. Its castles are, well, France has castles. Even its economy is twice as large. Everything might still be big in Texas, but most of it is quite a bit smaller than in France. Texas certainly has its charms. But for this traveler, Vive la France! I loved travelling in France, it is a beautiful place as you say, and like you i would love to spend a year really experiencing it. I have only been in the Dallas Ft Worth area, so can’t say that i know Texas – but I think to really enjoy the state you have to enjoy the rural life, wildlife and landscape photography, being alone, watching the stars sparkle. I do enjoy reading your blog. I’ve driven across Texas several times. The stretch from El Paso to San Antonio goes on for never ending, boring ages. I like rural and wildlife and landscape photography, but Texas was uninspiring. Most folks seem to be too full of themselves. For my part, I’d just as soon give it back to the Mexicans as long as they take Bush and Perry, too. I’m sure Texas has its charms, but it is pretty hard to beat Paris as a destination. I love France, but prefer Italy, which is why we bought a house there. Thanks for sharing your comparison. I can think of many other reasons why France is better than Texas but I won’t weigh you down with that. 🙂 True…things are bigger in Texas (some of them not so positive) but not Everything. That statement mostly refers to bigotry, farm-raised people, self-righteousness, and some food items. Lots of Texas is flat, unused or unusable land. There are fair less attractions/sites of interest, from place to place, to explore and visit. Texas bashing is a national sport. A few more centuries of practice and we may be able to match the French when it comes to looking down on others! I don’t think anything that is written in the post can be construed as looking down at others. There is no inference that the French people are somehow better than Texans. The whole piece is really just an expression of my continual amazement at how much France packs in to an area the size of Texas. Sure, it is written in a way that pokes a little fun at Texas. But you’d think a state known for its swagger could take a little ribbing. I’m in complete agreement with your post and have no issue with it at all. I also agree Texans definitely need to have sense of humor and shouldn’t get riled up by having someone poke a little fun at their state. My comment was directed not at your post but at the cheap shots taken by Gus and Eklctc. I don’t believe any sense of humor is large enough to overlook comments of that nature. No need to apologize. I actually expected this post to generate a more full-throated defense of the Lone Star State than what I got. After all, we have signs hanging all over the place saying “Don’t Mess With Texas” and here I am poking it with a stick. PS: I say “we have signs . . .” because I’m legally a Texas resident now too, even if I’ll always be a Yankee in reality. I love visiting France too – wrote quite a lot about it for my blog this summer – but I have yet to visit Texas (closest I’ve got is Arizona, at the age of 8). My experience of Texas is sadly limited to having a school friend who came from El Paso – and to TV experience of “Dallas”, now being rerun on British TV! But I so enjoy visiting places via your blog, thanks for another interesting post! It always makes me a little sad to drive past towns like Rome, Georgia or Paris in Texas and Arkansas. It’s almost like they’re trying to be something they’re not. Do you think towns can have self-esteem issues? Judging Texas based off of driving through the Pan Handle/West Texas is like throwing the ice cream away and just eating the dry, stale cone. There are so many historic, super quaint towns with great appeal in Texas… especially in the Texas Hill Country (Fredericksburg sticks out the most). But honestly the first mistake here was comparing France and Texas at all. The only thing they have in common is geographical size. It’s so easy to say France is more appealing that Texas or Colorado or Florida or any state you’re from or live in or have spent a great deal of time. Any foreign place (especially France!) has a strong romantic and adventurous attraction to any traveler, Texan or not. Live in France long enough, it will lose it’s appeal. I think it’s nice when people are optimistic about what’s around them. I have lived all over, the Texas Hill Country is my personal favorite. It may not be yours… and that’s okay. “So many historic, super quaint towns with great appeal in Texas” is one Texas-sized overstatement. Yes, Texas has some cool places . . . Austin, San Antonio, Fredricksburg, even Houston has come in to its own. But the list gets pretty thin pretty quick. By the time you get down to Marfa you’re really stretching. In between these few places is miles and miles of nothing. Try to do the same thing for France . . . Paris, Bordeaux, Nice, Aix-en-Provence, Amboise, Marseille, Chinon, Angers, Orleans, Congnac, Mont Saint-Michel, Strasbourg, Giverny, Chamonix, Rouen, Carcasonne, Bayeux, Verdun . . . the list goes on, and on. For an avid traveler to prefer Texas they’d have to have a very narrow set of interests that marry up with the specific things Texas offers – an Apache scholar and barbecue aficionado with a particular fascination for the Mexican-American war maybe. On more general terms it’s hard to see France not coming out ahead. It’s history is longer and of more global importance. It’s cities more spectacular (Paris v. Houston, Dallas v. Marseille?) It’s culinary traditions are more varied and deep. It’s the birthplace of world-renowned artists, philosophers, and writers along with the entire cultural traditions and movements that they inspired. It’s architecture runs the gambit from the Roman Empire, through middle-age defensive, past Gothic and Renaissance, to modern. It’s geography includes alpine mountains, valleys covered with vineyards, and longer coastlines bordering two distinct bodies of water. Sorry, as far as travel destinations go it’s not even a close call. Thing is, Texas was late to the party! I mean, France is over 2,000 years old and Texas is not even 200 (it was annexed in 1845). I have yet to visit France (2017) but I am sure it is everything you say and more. But comparing France to Texas is like comparing Europe to the USA, quite not possible. Maybe wait until the year 4016 to compare again, lol. Texas is a state. France is a country. You’d expect it to have more interesting sites, sights, and cities, even though Texas is geographically bigger.